But that’s not surprising in the least. The sheer amount of tools they put out individually is gargantuan but when looked at collectively, the figures become staggering. For years I was stuck with my dad’s corded electric drill with chuck and key–and of course the key was never nearby when I needed (well, wanted) to use it for something. Not only that, that old thing wasn’t at all like the newer Craftsman drills or its peers–it was heavy, lacked a variety of features, and was far from portable. and then compile them here. I didn’t go by rating alone because that just wouldn’t make sense, given how one of the kits I saw was a perfect 5/5 stars but had only sold 10 kits, so some thinking was required to figure out which ones were deserving of the best. The last thing to note is what I mentioned above: Makita and DeWalt alone are the real winners on this list, and they make up an amazing 80% of this list with DeWalt nudging out Makita 5 to 3, and that’s hard for me to accept because I love myself some Japanese tools! The DEWALT DCF880HM2 20v MAX* Lithium Ion 1/2-inch Impact Wrench Kit features a compact (5. 70″ front to back), lightweight (3. 4 lbs) design that fits into all kinds of tight areas. It has three (3) LED lights with 20 second delay after trigger release, that helps to provide visibility without shadows. Also features a hog ring anvil to easily change sockets. Drive size = 1/2-inch square drive. The textured anti-slip comfort grip provides maximum comfort and control for the user. Powered by a XR Li-Ion battery with fuel gauge which provides 33% more capacity over standard packs. Applications include: Driving and removing fasteners in wood, metal or concrete/ Fastening and removing nuts and bolts/and Primarily for use with impact sockets . Includes: Fast Charger, (2) DCB204 20V* MAX XR Premium Li-Ion Batteries (4. 0 Ah) and Kitbox. (*Maximum initial battery voltage – measured without a workload – is 20 volts. Nominal voltage is 18. ). The Makita 18V LXT Lithium-Ion cordless 1/2” impact wrench (model Xwt04) delivers high torque impact power with a ½” square drive that will fit impact-rated socket sets. The versatile Xwt04 packs plenty of torque for a wide range of fastening and loosening tasks, and is a powerful and convenient substitute for air powered and AC wrenches. Makita-built motor engineered for versatile power – the Xwt04 features a Makita-built high torque motor that delivers 325 ft. Lbs. Of max torque, 1,600 RPM, and 2,100 impacts per minute for a wide range of fastening tasks, including removing transmission bolts and lug nuts. Makita’s proprietary hammer and anvil impact mechanism are manufactured using the best raw materials with the highest quality steel and unique heat hardening process for maximum fastening and driving power. The unique rubber joint shock absorbent handle helps protect the battery housing from vibration. Ergonomic design in a compact size – the Xwt04 weighs just 7.5 lbs. And is 10-1/2” long with an ergonomic shape that fits like a glove for reduced operator fatigue. The Xwt04 is equipped with a large rocker switch for easier tool use – even with gloves – and a 1/2” square drive with detent pin is designed for quick release. A built-in L.E.D. Light illuminates the work area for more efficient work. Versatile design for a range of applications – the Xwt04 is a cordless option to air powered and AC impact wrenches. It is engineered for a range of fastening and loosening tasks and is perfect for steel beam construction, I-Beam construction, utility pole, telephone and cell phone pole installation, overhead door installation, mudsills, automotive work, conveyor systems, HVAC, fire sprinklers, oil fields and refineries, anchors, tilt-up construction, and more. It is ideal for steel contractors, commercial contractors, automotive line assemblymen, automobile mechanics, residential contractors, HVAC contractors, and any Pro tradesman requiring a best in class engineered impact wrench. 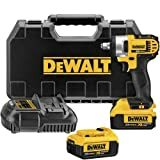 The DEWALT DCF899P1 20v MAX XR Brushless High Torque 1/2″ Impact Wrench Kit w. Detent Anvil, 5.0Ah features a brushless motor which is designed to provide superior run-time, performance and durability. It has a heavy-duty impact mechanism with a max torque at 700 ft./lbs. for best-in-class torque with the most demanding applications, with a max breakaway torque at 1,00 ft./lbs. This tool features a 3-speed selector switch that allows for application specific torque/drive control. It also has a LED work light with a 20 second delay that will provide visibility when working in dimly lit spaces,. Even though this tool is ergonomic and lightweight, it can handle a 6-8ft drop and the anvil is resistant to shearing and breaking! A battery fuel gauge indicator will inform you about the level of charge available in the battery pack. The detent pin offers strong socket retention so to help avoid dropping sockets in various construction situations. Includes: 1) DCF899 Impact Wrench, 1) DCB205 5.0ah Battery and 1) Multi-voltage charger. The DEWALT DCF880B 20-volt MAX Li-Ion 1/2-Inch Impact Wrench Kit with Detent Pin (Tool Only) is a compact tool that fits into tight areas. A part of the lightweight, yet powerful line of DEWALT 20-volt MAX products, this would be a great addition to any toolbox. Battery not included. 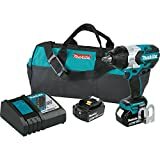 The Makita 18V LXT Lithium-Ion Brushless cordless high torque 1/2″ Sq. Drive impact wrench w/ friction ring anvil kit (XWT08T) combines 740 ft.Lbs. Fastening torque and 1,180 ft.Lbs. Break-away torque with extended run time and speed control for unmatched fastening performance. It features an efficient Makita Brushless motor for longer run time, increased power and speed, and longer tool life. The electronic 3-speed power selection switch gives users more precise fastening control. It is ideal for a range of users, from iron and steel workers to pipe Fitters, railroad and automotive mechanics, forming carpenters, and more. 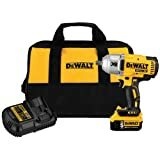 The DEWALT DCK240C2 20v Lithium Drill Driver/Impact Combo Kit (1.5Ah) is comprised of the DCF885 20V MAX Lithium-Ion 1/4-Inch Impact Driver which is compact (5.55″ front to back) and lightweight (2.8 lbs. ), designed to fit into tight areas. This unit offers one-handed loading 1/4″ hex chuck accepts 1″ bit tips, and also features a 3 LED light ring with 20 second delay to provide visibility without shadows. A belt hook is also included for portability on the worksite. The DCD771C2 20V MAX Lithium-Ion Compact Drill/Driver is also compact and lightweight, designed to fit into tight areas. 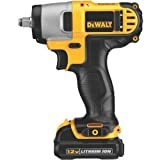 This drill/driver offers a high performance motor that delivers 300 unit watts out (UWO) of power ability, which allows for a wide range of applications. This unit also features a high speed transmission that delivers 2 speeds (0-450 & 1,500 rpm) for a range of fastening and drilling applications. The 1/2″ single sleeve ratcheting chuck provides tight bit gripping strength, and the ergonomic handle delivers comfort and control. 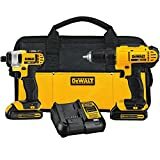 Both tools are part of the DEWALT 20-Volt MAX system and are compatible with all 20-Volt MAX batteries, chargers and accessories. 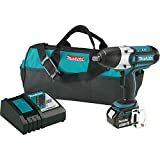 Includes: (1) DCF885 20v MAX Lithium Impact Driver, and (1) DCD771 20v Max Lithium Drill/Driver, (2) 20-Volt Maximum lithium-ion 1.5Ah battery packs, (1) 20-Volt Maximum charger and contractor bag. The Makita 18V LXT Lithium-Ion Brushless 3-Speed ½” Impact Wrench (XWT11T) combines extended run time and speed control for unmatched fastening performance. The XWT11T is powered by a Makita brushless motor for longer run time, increased power and speed, and longer tool life. Three speeds with reverse rotation auto-stop mode stops rotation in two seconds when fastener is adequately loosened, making the XWT11T ideal for automotive, installation, and fabrication trades. 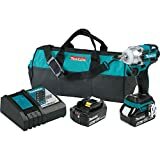 The Makita 5.0Ah battery, model BL1850B, combines more run time (65% more run time per charge than the Makita BL1830 battery) with a category-leading charge time of only 45 minutes so it spends more time working and less time sitting on the charger. For added convenience, it also features an on-board L.E.D. charge level indicator to monitor battery charge. The W5132 from Ingersoll Rand is the first 3/8″ cordless impactool that delivers the power of air at 365 ft-lbs of max torque. With 50% more power than the leading 3/8″ cordless impact and the iqv intelligent control system, the W5132 can go from max torque to “hand tight” and everything in between. 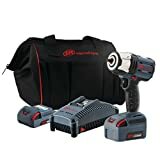 Kit includes tool, 5.0Ahr battery, 2.5Ahr battery, Universal charger and bag.